This edition is limited to only 200 in the world! Ready to hang right out of the box! Do you want to purchase this artwork unframed? 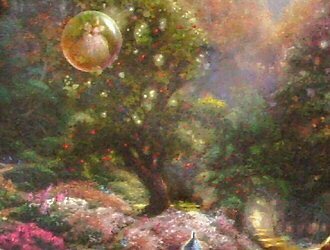 Warner Brothers Studios recruited Thomas Kinkade to be the official artist of the 1939 release of America’s greatest and best loved home grown fairy tales. 1. 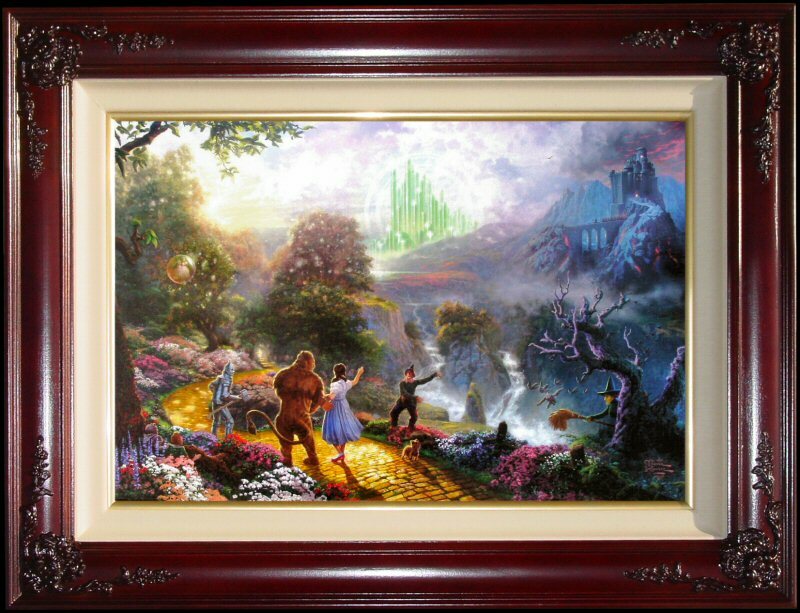 "Dorothy Discovers the Emerald City" is the first painting of a Warner Brothers film. 2. Thom utilized his imagination to journey beyond the imagery of the original film and recreated how Oz might have appeared employing modern special effects. 3. In the painting you’ll notice that Toto is the only character that reacts to the Wicked Witch, as the others are distracted by the awing influence of the Emerald City as they view it for the first time. 4. "Dorothy Discovers the Emerald City", as with Thom’s Disney collection, attempts to capture the quintessence of the complete film in one panoramic image. 5. Look closely along the Yellow Brick Road, to find the Apple Tree that said “Ouch”, when Dorothy tried to pick an apple off of it. 6. 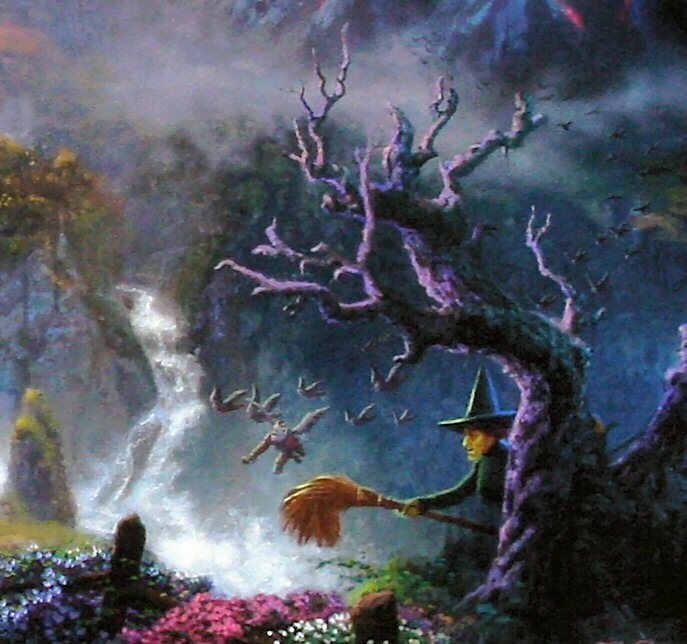 Look even closer to find a hidden toucan in the tree that Wicked Witch of the West is hiding behind. 7. Thom has hidden 88 dedication hearts to embrace the love of his mother Mary Anne- who celebrated her 88th birthday this year. 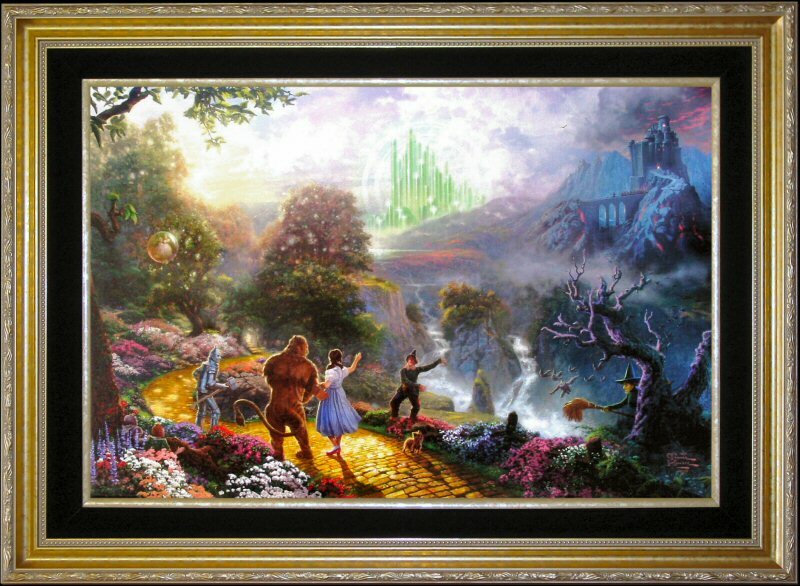 Dorothy Discovers the Emerald City is the first painting depicting a Warner Brothers film. ++++ Rare! Only 200 of this edition were produced. ++++ 18" x 27" Lithograph on Paper framed in your choice of approx 26" x 35" Antique Gold, Black Velvet Gold, or Brandy with fluted roses Museum Quality Frame ~~ ready to hang! 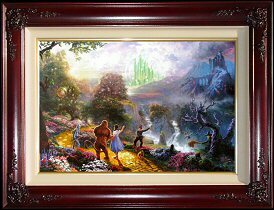 "Like most children of my era I was intrigued by The Wizard of Oz during its annual presentation on our TV screen. This adventure provided the ultimate daydream for a young artist whose imagination yearned to "follow the Yellow Brick Road". To recreate my passion for Oz in visual form, I utilized my imagination to journey beyond what had been created for the original movie. As is the case with my Disney paintings, each Oz painting will be an attempt to capture the essence of the entire movie in a single emotionally charged image. 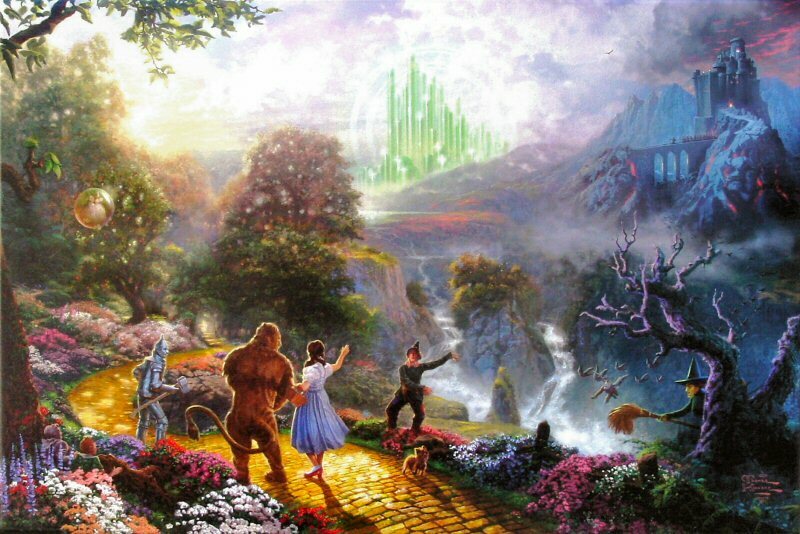 In the first Oz painting we see Dorothy and friends as they view the fabled Emerald City for the first time. The familiar cast of characters is here - Dorothy, Cowardly Lion, Tin Man, Scarecrow - as well as the Wicked Witch of the West, scary Winged Monkeys, and of course the Munchkins. We can even see Glinda the Good Witch floating in her transparent sphere of light, as though to bless the journey of the travelers. I envision this painting as the first piece in what I will refer to as the "Oz Octet", a collection of eight epic paintings intended to celebrate great moments from this classic film. The eight paintings in this collection will present a monumental challenge to my abilities as a story teller and picture maker. Yet like my Disney collection, I expect this collection to flourish as collectors discover that each painting builds upon the next. 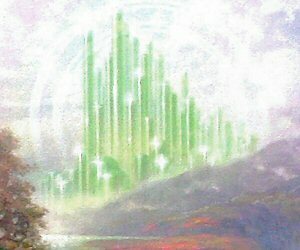 Dorothy Discovers the Emerald City is a panorama of the great places from the film. 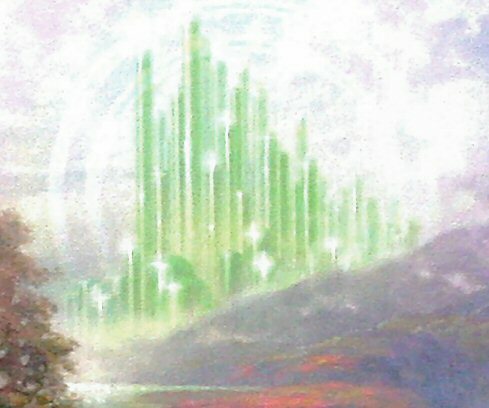 Though while watching the movie none of us can be entirely sure where the Wicked Witch’s Castle is located in relation to the Emerald City, I have placed it distinctly in the foreground suggesting a barren land that must be traversed to encounter the delights beyond. 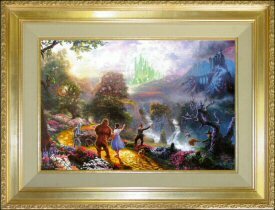 Like The Wizard of Oz film, my painting presents the raw emotions of myth and daydream as they collide with wondrous imagination.